In the early 1980s, Francis Ford Coppola visited Belize, immediately fell in love with the location and purchased the abandoned Blancaneaux Lodge. For more than a decade the resort was used as a family retreat before Francis opened his tropical paradise to the public in 1993. Blancaneaux has a spectacular location in the northwest corner of the 107,000-acre Mountain Pine Ridge Forest Reserve in western Belize’s Cayo District. 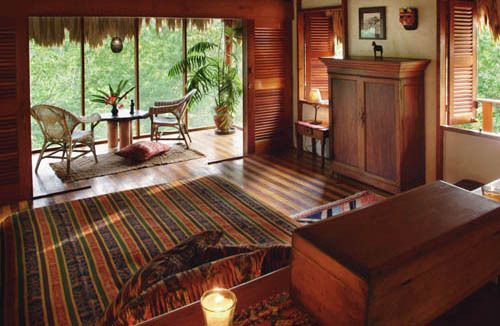 The lodge itself is set among tropical pines, oaks, palmetto, craboo and ancient melastome shrubs. The dense jungle, steep ravines, spectacular waterfalls and fast flowing rivers are uninhabited and home to many rare or endangered species of flora and fauna. Blancaneaux strongly supports Belize’s commitment to ecotourism. The buildings blend subtly into the natural environment, using low profile, environmentally sound designs, thatch, hardwoods, pine and bamboo, along with regionally produced tiles. There is no air conditioning, however windows, screened doors, ceiling fans and high, thatched ceilings allow sufficient air circulation to ensure a cool, comfortable and peaceful nights sleep and an opportunity to fall asleep to the sounds of the tumbling rivers and the sounds of the forest. You will see why Blancaneaux has such a trophy chest of accolades and a reputation for being one of the best resorts in Central America… we think it’s one of the best in the world! The gift shop, where the unique local artisan made items are personally selected by Eleanor Coppola. The on site horse riding stables, offering equestrian sightseeing tours through the lowlands of the Mountain Pine Ridge Forest Reserve. The organic garden, growing all the organic vegetables and many of the fruits used at the lodge. The elevation and cool evening temperatures make it possible to grow a range of leaf lettuces, radishes, beans, carrots and beets as well as fresh herbs such as basil, oregano, cilantro and dill. The natural waters of Privassion Creek provide some of the reserve’s best natural swimming holes. You can swim in the deep, cool pools close to the lodge or explore the hidden rock pools leading to the stunning Big Rock Falls, a must see. The fresh water infinity pool at the lodge is decorated with brightly-colored ceramic tiles and surrounded by a stone patio. Handmade mahogany sun loungers surround the edge of the pool while the ‘Pool Captains’ are on-hand to provide towels and take drinks orders from the bar. The Waterfall Spa offers a variety of treatments, wraps and massages, as well as access to rejuvenating hot pools overlooking cascading waterfalls. The spa specializes in the art of Thai massage and features professionally trained staff that have studied the ancient techniques at the Sacred Wat Pho Temple in Bangkok. The ‘crème de la crème’ of the resort has an elevated open-plan living area, a private plunge pool and a large hardwood sun deck, set amongst lush tropical garden. An oversized hand carved antique dining table overlooks the tumbling waterfalls and deep rock pools of Privassion Creek. Accommodation includes two large bedrooms each with a spacious bathrooms featuring showers with hand-painted tiles and Japanese tubs. Francis’ personal art and antiques are displayed throughout, adding a personal touch. The Coppola Villa also features monogrammed bathrobes and wine glasses, locally produced organic bath products, goose down or hypo-allergenic pillows, iPod docking station, WiFi Internet access and a Shellphone intercom system linked to the resort’s front desk. The Coppola Villa has the added service of a full-time attendant, to anticipate your every need. Skirting Privassion Creek, the roomy 1,600 square ft villas feature a large and comfortable open-air living room with a small kitchen. Off the living room are two luxurious bedrooms, each with its own full bath. 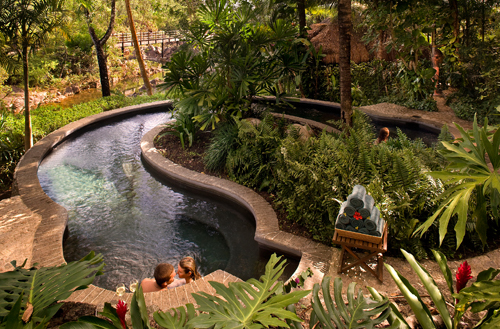 Perched over a Privassion Creek waterfall, the Honeymoon Cabañas offer the ideal hideaway. 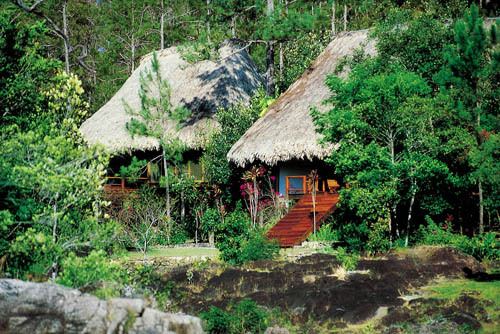 Both honeymoon cabañas have huge private decks overlooking the falls, for ultimate privacy. An expansive deck with wrap-around walkway ensures a spectacular view of the Privassion River. 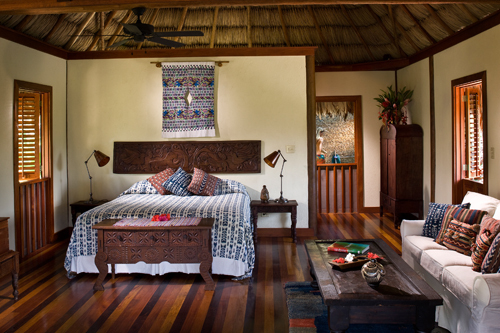 Elegantly themed with native art and local textiles, each cabaña offers a queen-size bed and hand-painted tile bath. Nestled in the beautifully manicured gardens, the comfortable Garden Cabañas showcase native arts and antiques, plus a large screened-in porch with hammock. 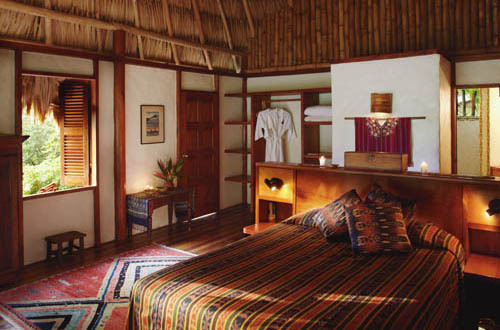 Since the Deluxe Cabañas opened in early 2008, they have quickly become the most sought after accommodations on the property. 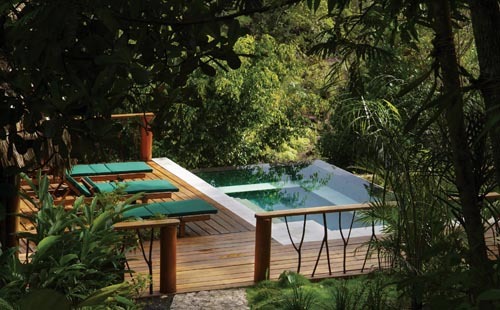 Surrounded by lush vegetation and just a stone’s throw from deep pools and tumbling waterfalls, the two Deluxe Cabañas offer a secluded setting at the far eastern end of the property. 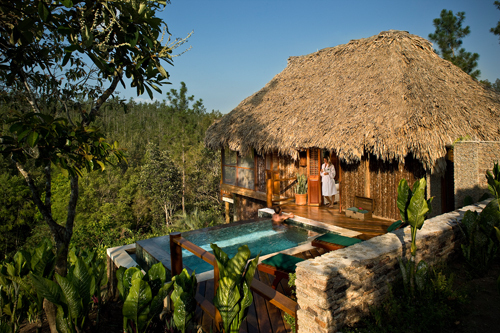 Reflecting Francis’ desire to create a haven to reflect, write and create, Blancaneaux Lodge’s hideaway retreat sits atop a steep forested bluff offering panoramic views over the tumbling waterfalls of Privassion Creek and the distant jungle clad Maya Mountains. The cottage features a bedroom with a king-size bed, writing desk and fireplace. The bath house provides understated luxury with under floor heating, open fire, shower, Japanese tub and steam room. The spacious kitchen includes a wine cooler, Delonghi espresso machine, a breakfast bar and a heated slate floor. Adjacent to the kitchen is an airy day room with queen-size sofa bed, large coffee table and comfortable armchair. Screened doors open onto the hardwood deck and the infinity pool. The Enchanted Cottage is secluded and surrounded by lush tropical gardens and spectacular panoramic views. Guests at the cottage enjoy monogrammed bathrobes and wine glasses, locally produces organic bath products, goose down or hypo-allergenic pillows, iPod docking station, WiFi internet access and a Shellphone intercom system linked to the resort’s front desk. The cottage also includes a full-time attendant to light fires, cook breakfast, prepare cocktails and anticipate your every need. With a large dining table, queen-size bed and a pair of twin beds, the Family Cabana offer the ideal space for families or groups. A large screened-in porch overlooks the beautiful gardens, compete with a large hammock to unwind in. Using the freshly grown organic produce grown in the on site organic garden, you will be spoilt for choice for options. The intimate ‘Montagna Ristorante’ serves classic Italian cuisine is served in a romantic tropical setting. The menu features traditional Italian dishes with a special focus on the Coppola’s own family recipes, drawn from their history in the southern region of Basilicata. Pastas, fresh fish and braised or grilled local meats are all prepared with organically-grown herbs and vegetables. Also on offer are made-to-order pizzas, cooked in an authentic brick oven. The poolside ‘Guatelamtecqua Restaurant’ specializes in the cooking of Guatemala, a mildly-spiced cuisine that draws on Mexican, Caribbean and Mayan traditions. Local favorites include Salpicon, shredded beef salad flavored with sour orange and cilantro, Jocon, chicken cooked with green herbs and spices, and Rellenitos, a delicious dessert consisting of plantains filled with sweetened black beans. The ‘Jaguar Bar’ is a perfect place to relax after a day of activities. The hand-carved slate bar, ceiling fans from the set of Apocalypse Now, framed pictures of local archaeological digs and handmade furnishings create a truly eclectic atmosphere. 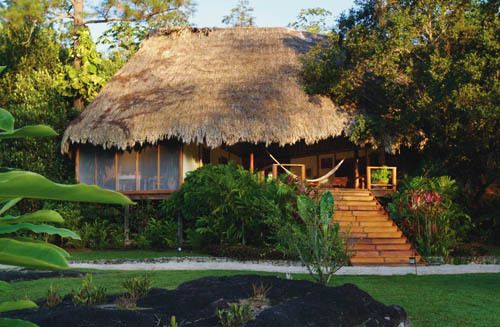 Rates start from US $289 per night for a Garden View Cabana to $1,552.80 per night for The Enchanted Cottage, 9% Govt. Room Tax & 10% Service Charge are applied. Rates vary according to time of year. Please contact us for room availability and more detailed pricing. Please view our booking terms.